Zwhip is a browser extension that claims to allow you to access content that is region restricted. While it may do as it promises, it will also expose you to big amounts of advertisement content. Which is why Zwhip Ads is classified as adware. It is a legitimate browser add-on and you can download it form the official website. But it also seems to spread via software bundles. Which essentially means that it can be attached to free software in a way that allows it to install alongside it. Zwhip Ads itself is not malicious but the ads that it generates might bring about trouble. You could be exposed to some dangerous websites and end up with malware on your computer. If you care about your computer’s security, you should delete Zwhip Ads from your computer. Why should you uninstall Zwhip Ads? You might have obtained the add-on from the official website. However, if you had not done that and still ended up with Zwhip Ads, then you must have recently installed free software that had Zwhip Ads attached to it. If you install freeware and not deselect the added items, those items install as well. In order to deselect them, you need to use Advanced (Custom) settings during the installation. In those settings, you will be able to deselect all bundled items. What you should not do is pick Default settings. If you go with them, you will not even know anything is attached. Choosing Advanced (Custom) settings takes mere seconds and you would not need to remove Zwhip Ads or similar. As soon as you install Zwhip, it will immediately starts generating advertisements. Ads will flood your screen and not leave you alone until you delete Zwhip Ads from your computer. You might not think it’s a big deal but the ads will quickly get on your nerves. They will come in various forms, including pop-ups and banners. Zwhip Ads aims to generate pay-per-click revenue for sponsored websites, and unfortunately, it’s at your expense. You need to be careful when dealing with ads made by adware. Even if they’re tempting offers, you should not trust them. Zwhip Ads will do everything it can to make you click on a ad. From claiming you have won something to warnings about infections. If you try to close those ads, you might be redirected to weird pages. Overall, it will be an unpleasant experience. In addition, you could be led to dangerous websites where malware is waiting for you. Which is why we recommend you remove Zwhip Ads from your computer. When you do, the ads will disappear. 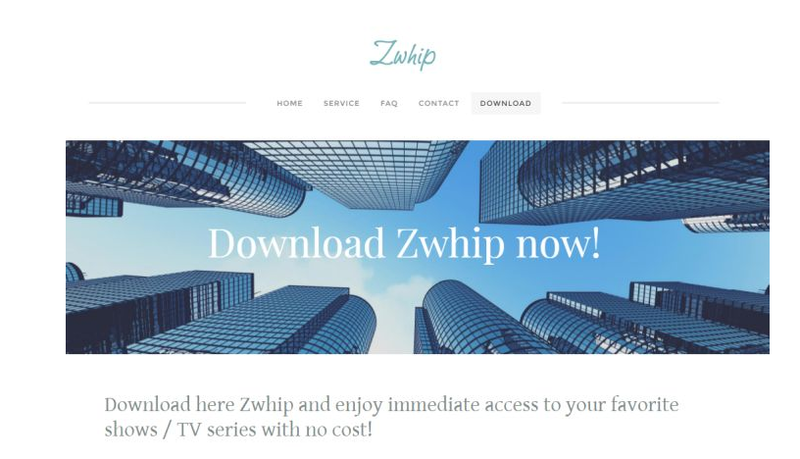 If you don’t have much experience with computers, you might want to employ a professional removal tool to uninstall Zwhip Ads. If you think you can erase Zwhip Ads yourself, you are welcome to use the provided guide below this article. After you take care of Zwhip Ads removal, you can return to normal browsing.